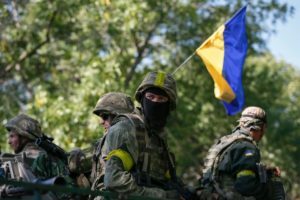 WASHINGTON — The Ukrainian central government accused pro-Russian rebels in eastern Ukraine of trying to break the ceasefire agreement. The rebels denied the allegations. Reuter reported the Ukrainian government said the rebels were being reinforced by “Russian mercenaries” and have increased shelling their troops’ positions. The European Union will discuss possible punishments for Russia, but it could be affected by the union’s reliance on Russian exports of natural gas and energy. Shelling in the eastern cities like Donetsk have led to both sides pointing fingers at one another, but has not relented in recent weeks. The recent election, where the Ukrainian parliament changed to a pro-E.U. majority, upset Russia. But, the rebels’ own election angered the West. The rebels blame the government for starting armed conflict again, while the government accuses the rebels of doing the same. Ukraine’s military spokesman, Andriy Lysenko, suggested rebels are shoring up positions in the port city of Mariupol and it could open up roads so Russian President Vladimir Putin could claim the southern Ukrainian territories. The ceasefire went into effect on September 5, 2014, but has been ineffective.